The quest for Yeastie continues. But once again ends in failure. Once again I’d stumbled upon a Spoons that didn’t have any of the overseas offerings. Have Spoons managers suddenly gone all Xenophobic? Shame on them. I decided to go for half of the Greene King Double Hop Monster IPA as I’d heard some decent things about. If fellow beer geeks are saying decent things about a GK beer then it must be truly awesome. It was decent. Decent enough that’ll I’ll try it again. It lingering dry bitter finish reminded me of the Stone/Adnams DIPA collab from earlier in the year. Perhaps the GK crew have been taking a sneaky peak at Adnams’ homework. The pub, as I’m sure you will have guessed, is named after the famous Two Ronnies sketch. Ronnie Barker attended a school (now part of the University’s History Faculty) that was located more or less next door. Naturally, the pub has some fork handles on the wall. I look forward to the Head of Naming Newly Acquired Acquisitions at Spoons calling a pub The Phantom Raspberry Blower of Old London Town. While I was sitting supping my ale I couldn’t help noticing the dark grainy wood that the bar’s constructed from. It reminded me of Copenhagen airport. Perhaps one day Greene King will be invited to attend the Copenhagen Beer Celebration. Perhaps not. 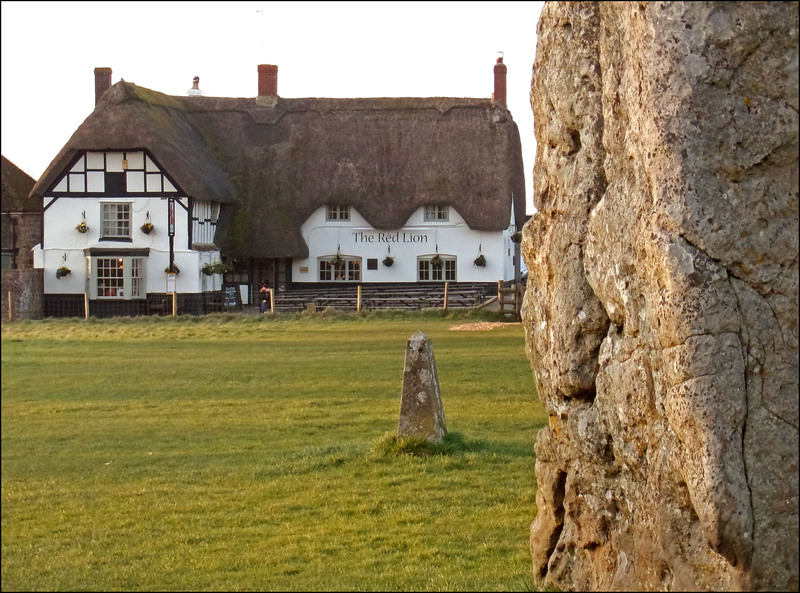 The Red Lion in Avebury is the only pub in the world that is located inside a stone circle. Such a beautiful fact immediately suggests that the owners are going to pursue one of two routes: Sell the very best beer and wine and food and thereby give your unique location something it truly deserves or just play the tourist trap card and go mass market. Sadly, Greene King, the owners of the Red Lion, have opted for option two. I first visited the Red Lion way back in the early autumn of 1994. In those days I lived down in St Columb Major in Cornwall. I’d spent the summer washing dishes in a restaurant in Newquay but as the tourists had vanished so had my need to remain in one place. Time for a holiday. I hitchhiked up to junction 15 of the M4 and from there I walked the 15 or so miles down to Avebury. I arrived at the end (or beginning) of The Ridegeway in the late afternoon. From there I scouted along the edge of the A4 until I reached the pathway to West Kennet Long Barrow. West Kennet Long Barrow is fantastic place. It’s a place that you should try to visit at least once in your life. If you manage to make that first visit I’m certain you’ll return many times in the future. From West Kennet I made the short walk to Silbury Hill. I’m not sure what’s the greater crime: Not knowing that Silbury is a man made hill or not knowing that you are not permitted to climb it. I climbed Silbury. I genuinely did not know that Silbury was manmade and that climbing it is a big no no. Oh well. I won’t do it again. Promise. When I reached the summit I met an artist from Liverpool who was there to paint the sunset. Just like me, it was Julian Cope who was the catalyst behind his visit to Avebury. The sun had almost vanished so I descended from Silbury and followed tracks across the fields to the village of Avebury and to the Red Lion. Way back in those days I wasn’t a beer geek. Way back in those days I don’t believe the term beer geek even existed. I believe the term was bugger pisshead. Or drunk. I had some beer and a rump steak. It was all perfectly acceptable. Then I left. But I had nowhere to go. I wandered back to the big NT car park. It was still a couple of hours before midnight but I had nowhere else to go so I rolled out my sleeping bag and clambered in. I was visited by a couple of folk who had come to walk their dogs and a couple more who had come to smoke their joints but within time I slipped into slumberland. At some point during the night – no idea when as I had no means of telling the time – all the animals in the surrounding area went ballistic. The crows and cows and sheep had all been severely spooked by something and they weren’t too proud to admit it. The noise awoke me and terrified me. I scooped up my belongings and ran. But to where? And why? I stopped. I had nowhere to go. I would have to face the evil alone. I returned to the spot I had run from and once again laid out my sleeping bag. I clambered in and with a mixture of fear and shame I gazed at the sky. Several satellites slowly worked their way across my panorama. I watched them until I drifted off to sleep. I awoke in daylight but I could tell it was still an hour or two before normal people awoke. I wandered around the circles of Avebury and felt lucky that I was watching the early morning mists lap against the stones. When I’d completed a full circuit I returned to the Red Lion and waited for a bus that would take me to Bath. Ten years ago I was in Avebury for a very specific reason and today I was there to celebrate that reason. We had a wander around the village and stones. It’s a truly beautiful place but it’s strange how much beauty and magic can be corroded away when familiarity rears its head. I still visit Avebury every couple of months but these days I rarely go to the Red Lion. It only sells Greene King beers and the food it arguably of less worth then Wetherspoons. But ten years ago we went into the Red Lion so, by golly, we’d bloody well go in there today. The beers were the usual mass market keg nonsense and GK IPA and something that is branded as Avebury Well Water, which is a basic (3.9%) house ale that gets a different name in any GK pub that asks for it. It was alright. Fruity but dull. The staff were polite but officious and never bothered to enquire if we wanted anything else after our initial purchase. We didn’t. I used the pub’s Cloud WIFI to find out what time the Waggon & Horses (less than 2 miles away and a much better place to drink and eat) started serving food. Then we left.